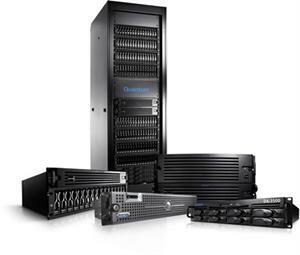 Designed for larger midrange data centers and consolidated backup environments, the DXi7500 Enterprise offers the industry’s widest range of advanced deduplication features including choice of deduplication and replication strategies maximizing performance and value. Whether you’re running a corporate data center or anchoring a multisite protection strategy, DXi7500 Enterprise is clearly a step above the competition. Quantum’s patented deduplication technology cuts costs by reducing disk needs by 90 percent or more and replaces removable media with WAN-based replication for disaster recovery. And you can scale systems easily as data grows, choose when and how to deduplicate, and integrate disk with tape for an optimal mix of short-term protection and cost-effective long-term retention. The DXi7500 Enterprise provides VM backup support for powerful protection for both virtual environments and conventional servers. And support for OST gives you consolidated protection across multiple sites and technologies with centralized, streamlined management through NetBackup and Backup Exec 2010.